eating well | Geek Girl Travels: The Letters of GeGi. 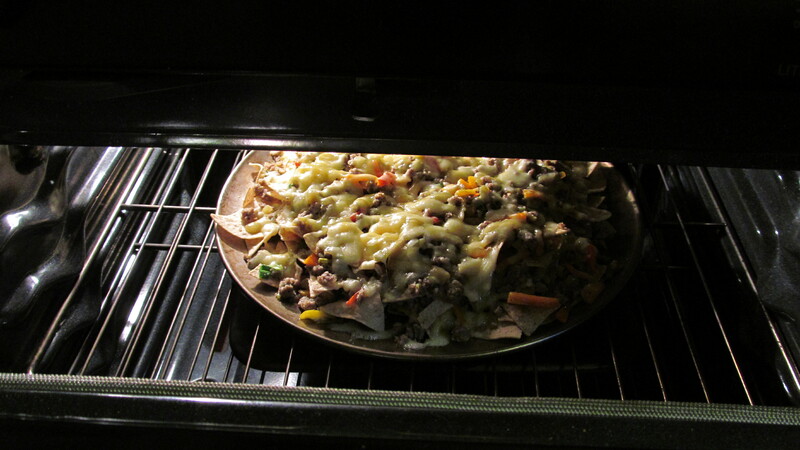 The other night, I made my parents nachos for dinner. My dad was so impressed that he requested we have them once a week from now on. Luckily, I took pictures of the whole process, which means that not only can I recreate that tasty goodness, I can also share them with you. It was super easy, fast, delicious, and filling! That’s a great combo for a perfect dinner, or even a big lunch. I had re-fried beans out, but decided not to use them. That turned out to be a good call, because we barely finished what I did make. However, if for some reason you decide not to use meat, then the beans will help make it a full meal. Now, break out a big pizza pan and preheat the oven for 350 (Fahrenheit). Grate the cheese, chop the veggies, and get a skillet going to cook the sausage and onions. 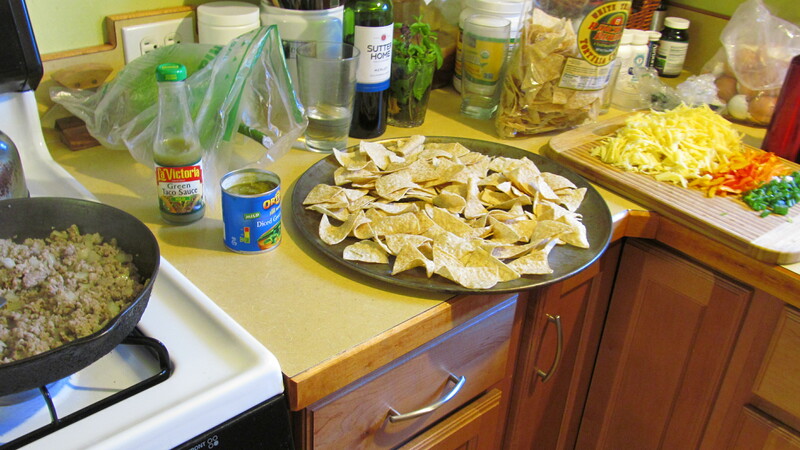 While you wait for the meat to cook, spread the first layer of chips on the pan. 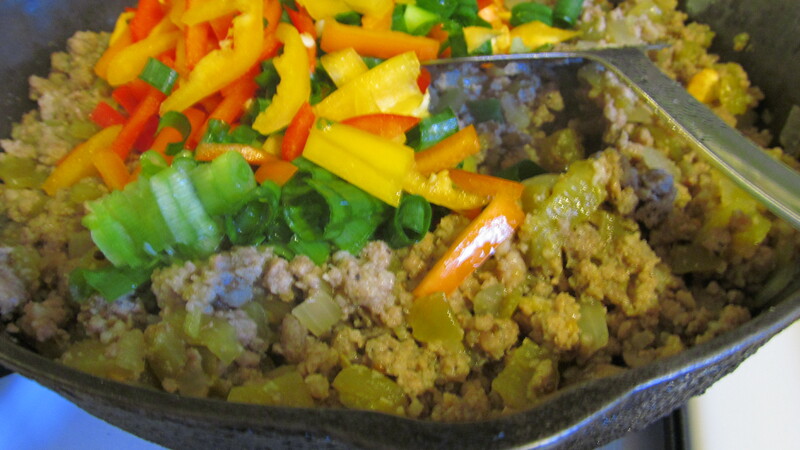 Once the onions and sausage are cooked, season them with the garlic and cumin, and add the diced green peppers. 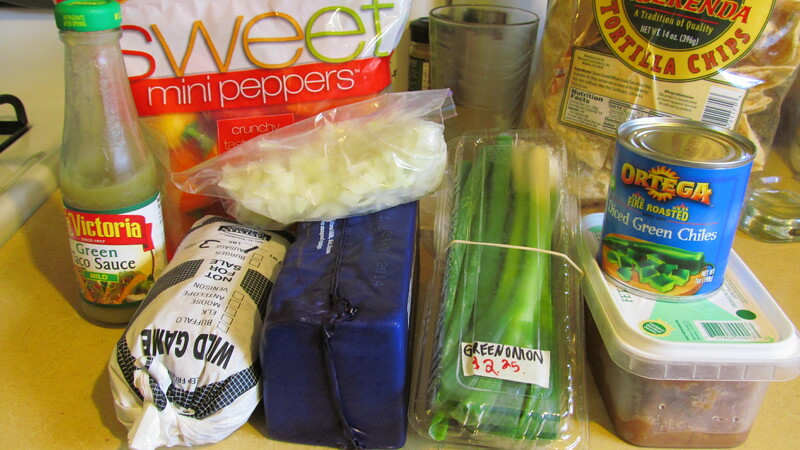 Mix it all together, and then add the bell peppers and the green onions just long enough to them to get heated through. The key here is to have all the indigents that aren’t chips, cheese, or green sauce already hot, BEFORE melting the cheese in the oven. This helps your nachos to be evenly hot all the way through, with the bonus of the cheese melting faster. 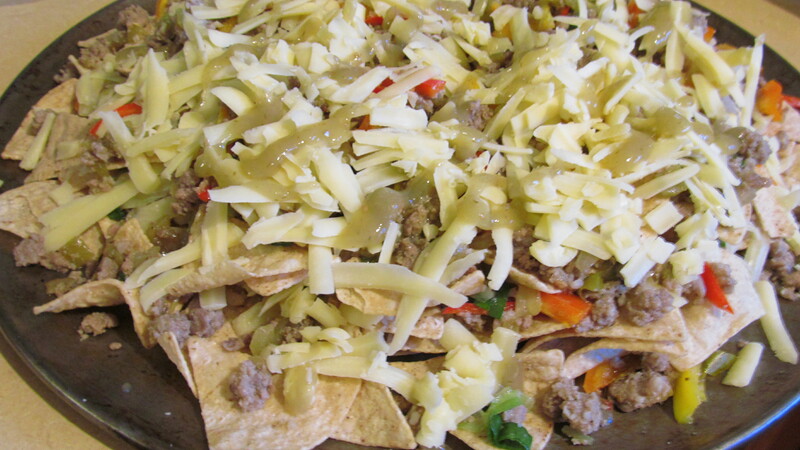 Now start layering: meat-and-veg over the chips, then cheese and green sauce, then more chips, etc. I did two layers of each. Try and keep the layers even to the edges of the pan. It’ll heat unevenly if there’s a mound in the middle, plus it’s just nice to have a little bit of the goodies on every chip! Now put the whole thing in the oven. I didn’t time it, just kept an eye on the meltiness of the cheese. I’d say at least 10-15 minutes, maybe longer. When all the cheese looks melted and is starting to get crispy where it dripped on the pan, it’s time to take it out! Remember, since all the meat and veg was cooked already, you don’t have to worry about checking the temperature or making sure the middle is hot. Yay for short-cuts in cooking! So tasty! And messy! And filling! And delicious! And easy! I used two spatulas (one on bottom, one on top) to transfer a third of this to each dinner plate. It worked quite well, actually, which surprised me. P.S. 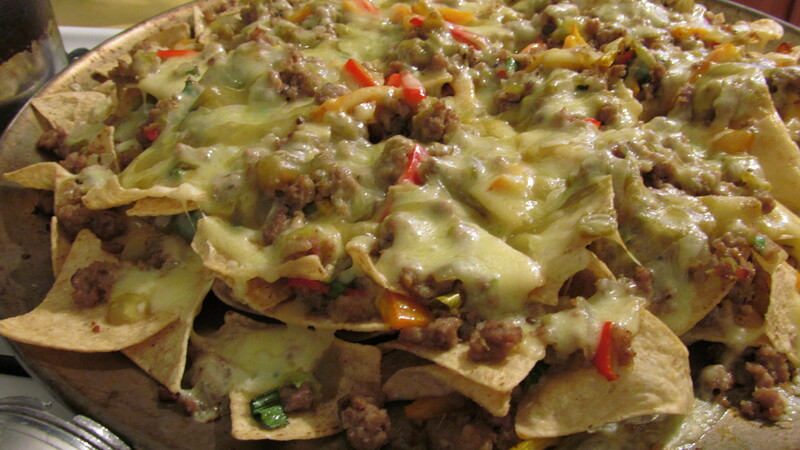 Leave a comment and tell me: what are some of your favorite combinations for nacho toppings? I didn’t take step-by-step photos this time, but this dinner is so easy and can be made with so many different combinations that you don’t really need them. 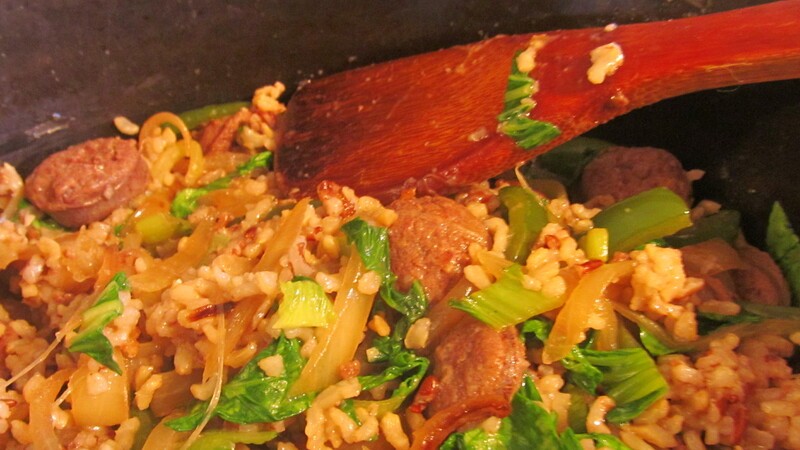 Pictured above is a mixture of rice, sausage, onion, garlic, bok choy, and bell peppers. It was sauteed in oil in a cast iron skillet, and seasoned lightly with salt and tamari (like soy sauce, but better). To make a quick and easy dinner melange, simply pick a base (rice, noodles, mashed potatoes, etc), saute several veggies, add a protein, throw in a little seasoning, mix it all together, and there you go! It’s simply, healthy, doesn’t take a lot of planning, and can be made and served with a minimum of washing up afterwards. Plus, it’s always filling and delicious. It’s good to have a few back-up meal ideas like this; it can be tailored to whatever situation you find yourself in, stretched for more people, made with any groceries or left-overs, altered for any nutritional requirements, easy to reheat later… and it’s a complete meal in one serving! I think pretty much every cuisine has something like this, and for good reason: fancy or complicated dinners are awesome, but only if you have to make them every once in a while. 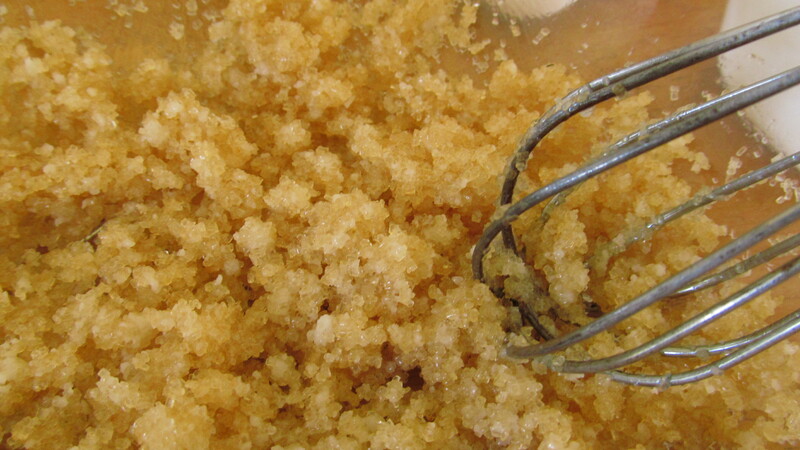 If you need to make your own food every day, you’re going to need some short-cuts. Plus, since there are basically infinite combinations for this meal, you won’t get bored of eating the same flavors over and over (or is that just me?). 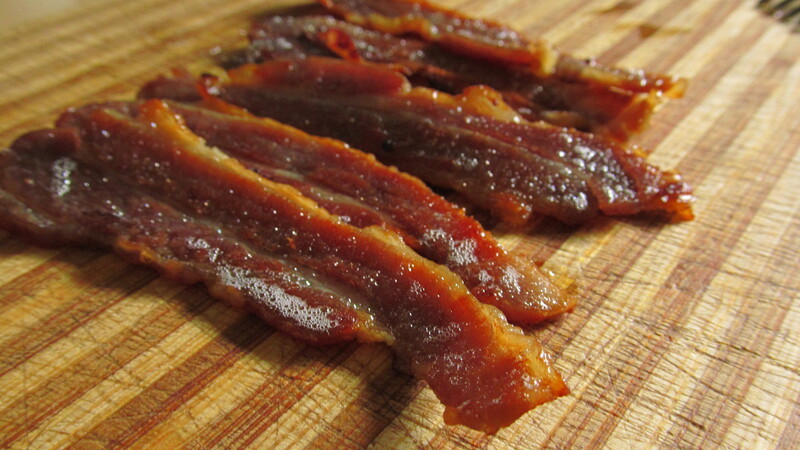 Home-cured, home-made, smoked bacon from home-grown, GMO-free, organic pigs is just…the best thing ever. Seriously. So it’s obvious I had to use it in a recipe. This has become my go-to recipe book for ideas of the quick and easy. I’ve already shared one of my standard recipes in this post, so now it’s time for another one: Drop Biscuits. There’s a couple variations, but all use the same proportions of ingredients as a base, so it’s easy to mix-and-match what you want. The biscuits are a yummy snack if you’re in the mood for something more savory than a muffin, and they are a great accompaniment for soups and salads. I’ve even used them to make the most awesome mini tuna melt sliders! 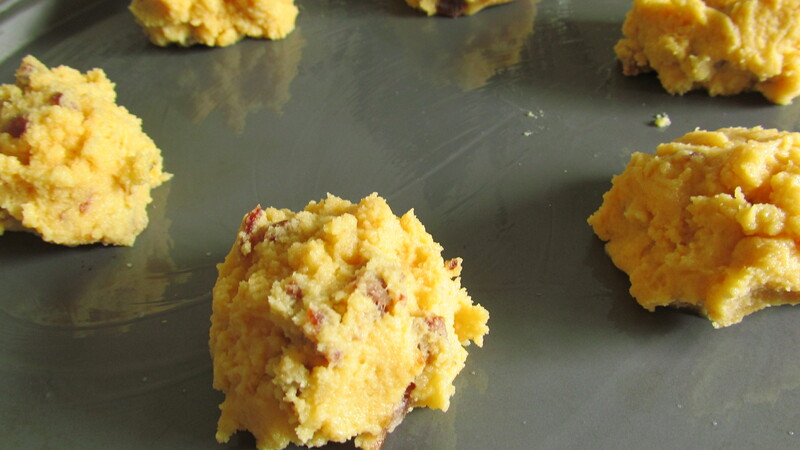 I made the Bacon Biscuits this time, but since the variations are so similar and easy, I’ll give you them all at once and you can experiment as you like! To begin, preheat the oven to 400 degrees Fahrenheit because this is going to go fast. 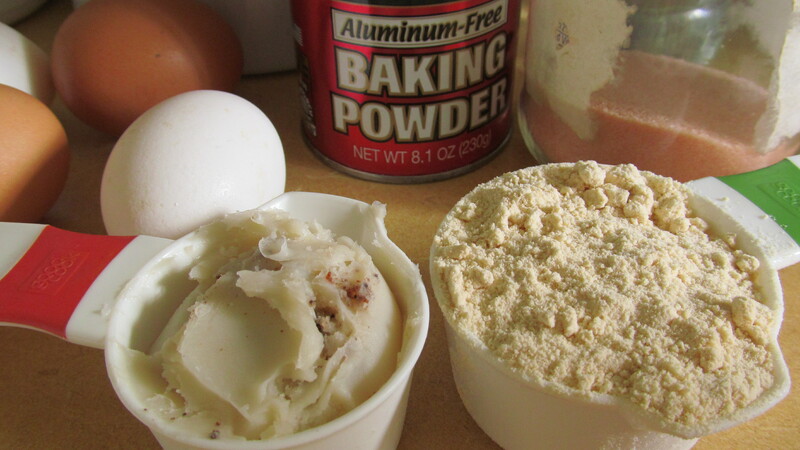 Combine the eggs, bacon drippings, salt, garlic powder, and raw sugar, and beat it with a whisk until smooth. Pro Tip: I’ve found that hand-whisking the eggs in coconut flour recipes really helps end result be more fluffy, since there’s no gluten to do that job and the baking powder doesn’t seem to have quite the same effect alone. 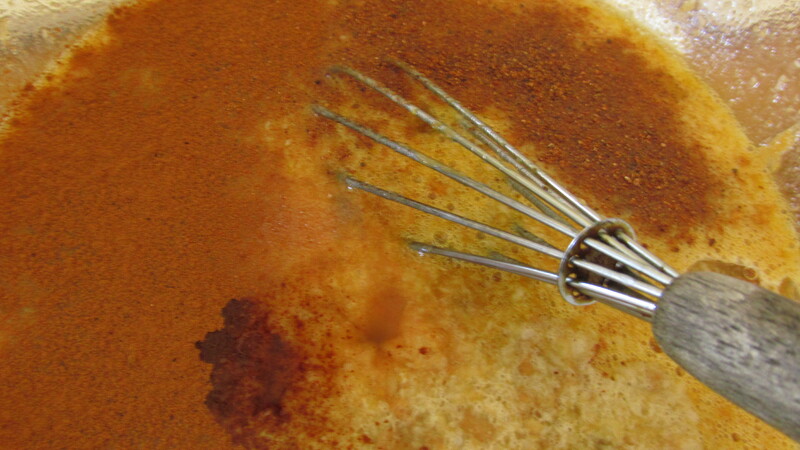 Then add the coconut flour and baking powder, and beat it more with the whisk until blended. Add the bacon crumbles and fold together with a spoon. 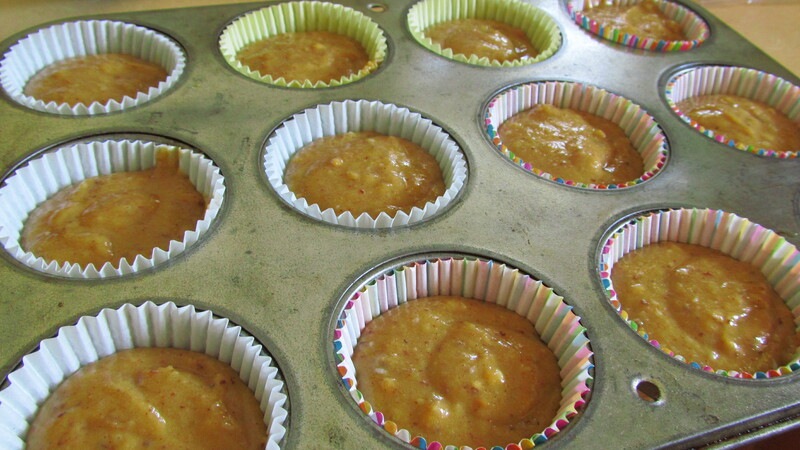 Drop fluffy spoonfuls onto a greased baking sheet (I used coconut oil). They should look something like this. The yellowness comes from yolks of our farm eggs, because our chickens get to feast on grasses and weeds. Bake for 14-15 minutes. I did 15, but probably would have been fine with less time. Sometimes I need more. It just depends, so go low and check them before you take them out. You can always add more time if you need to. They’re delicious fresh and hot from the oven, or cooled down. They’re even great when they’re cold from the fridge; and if you have leftovers, that’s where you’ll want to keep them. The high egg content means they spoil quickly on the counter, but they keep just fine for several days when refrigerated. I haven’t tried freezing them yet — since I tend to eat them all before they’d get there — but if you do try please let me know how it works out! Happy eating, and enjoy your food! Posted in Food	| Tagged bacon, bacon biscuits, baking, biscuits, breakfast, cheese biscuits, coconut flour, Cooking Day, eating well, enjoy your food, food, geeking out, GF biscuits, good food, how to make good food, making healthy choices, Pro Tip, quick and healthy food, recipe, snacks, tasty tasty! 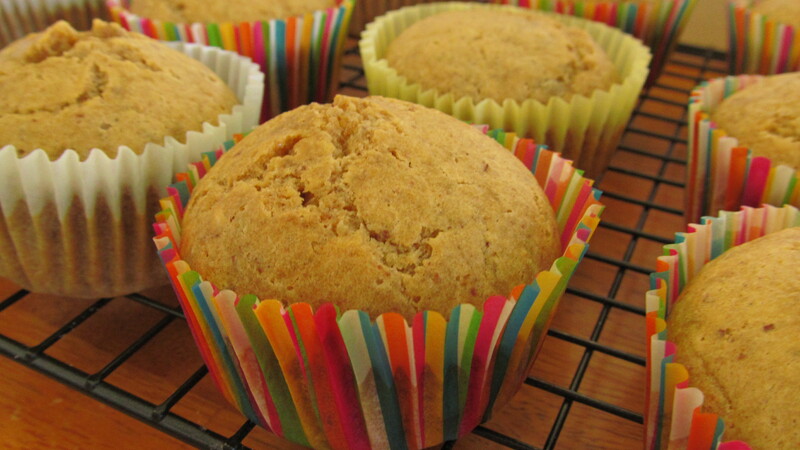 Coconut and Almond Flour Peanut Butter Muffins. 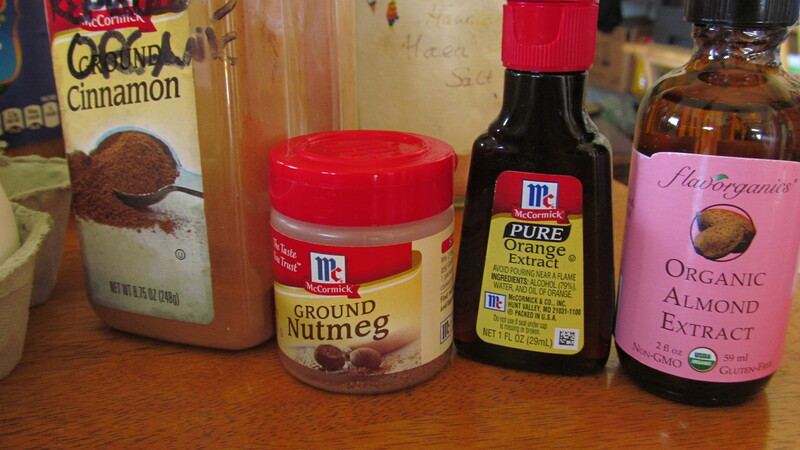 Time for another recipe! I’m going to show you how I make something that quickly became a staple of our household: Coconut Flour Muffins. 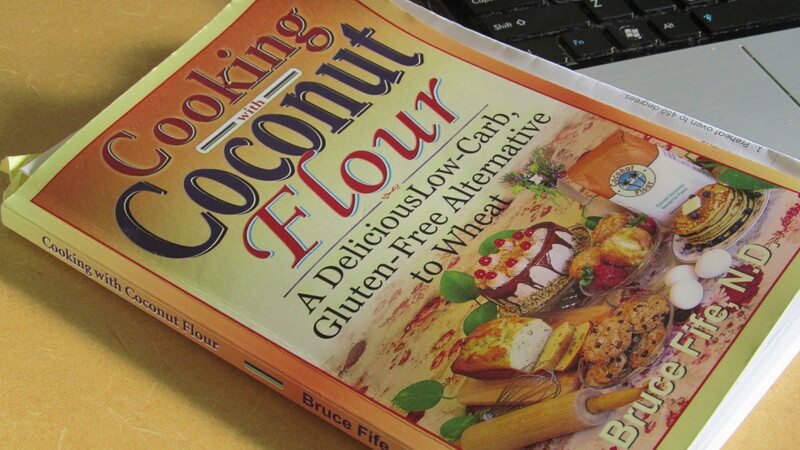 You can find the original recipe, and many others, in the very informative Cooking with Coconut Flour: A Delicious Low-Carb, Gluten-Free Alternative to Wheat, by Bruce Fife, N.D.
A generous dash or two of Cinnamon and Nutmeg. 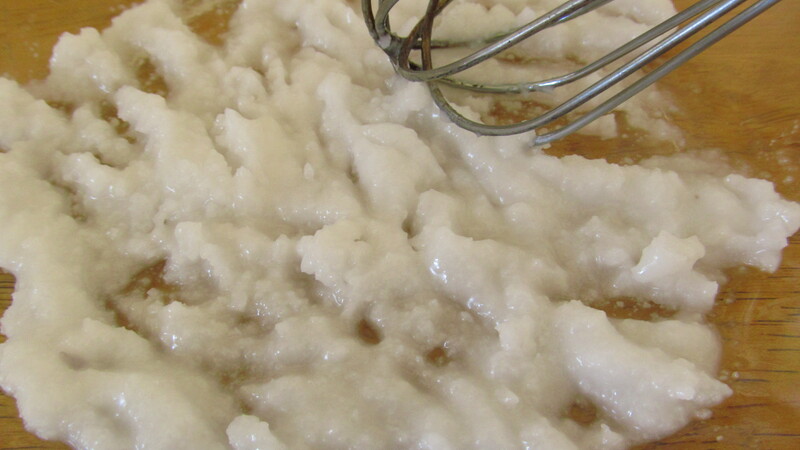 Depending on the room temperature of where you live, the coconut oil made be solid, liquid, or somewhere in-between. Since it’s been a little cool in Hawaii, the coconut oil is semi-solid right now. If it’s totally solid, you’ll want to warm it up before you start. 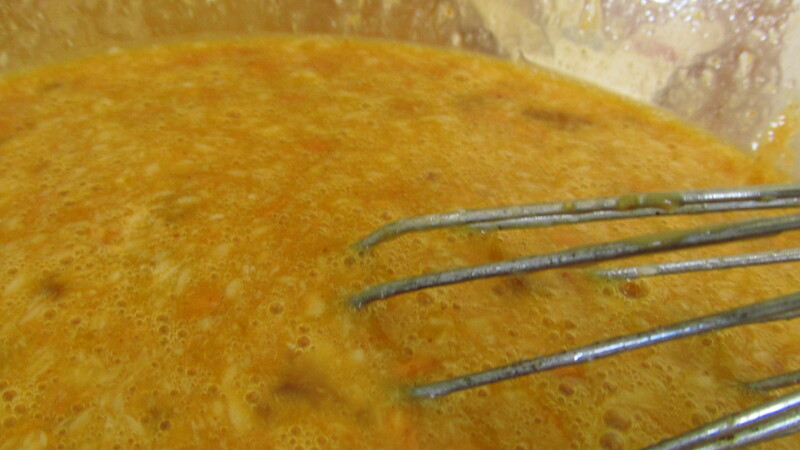 After everything else is added and blended smooth, then you add the flours and baking powder last. 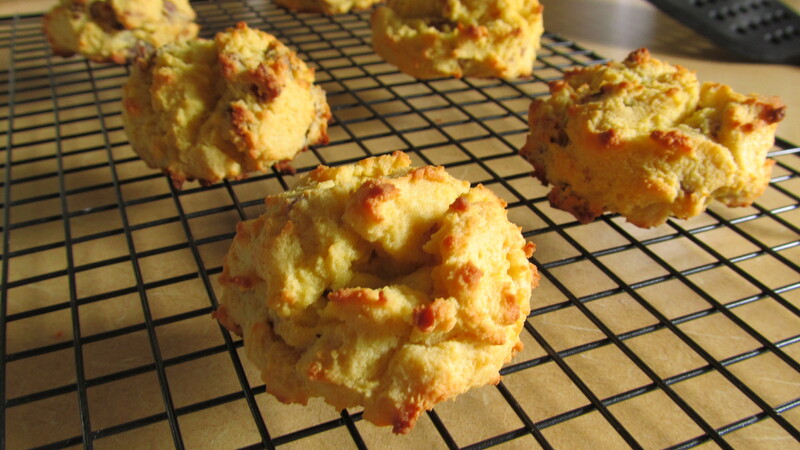 The original recipe calls for all coconut flour, which is a perfectly yummy option. 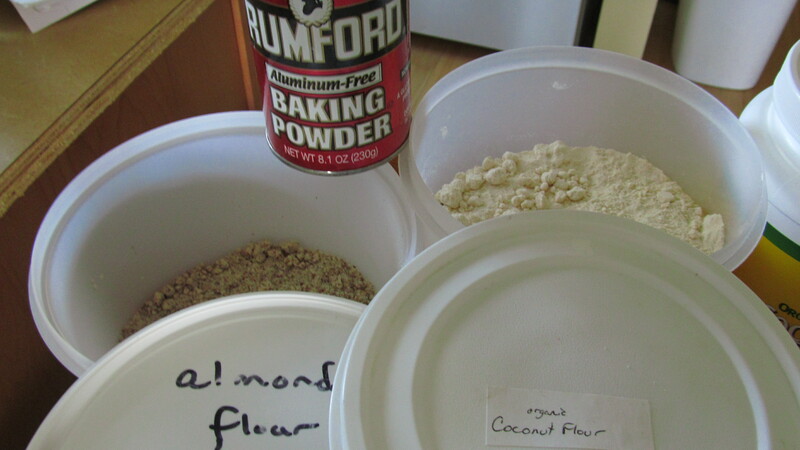 Just remember that coconut flour is REALLY good at absorption, so the longer it get mixed and sits, the thicker it will get. Perfect for dropping into muffin tins! 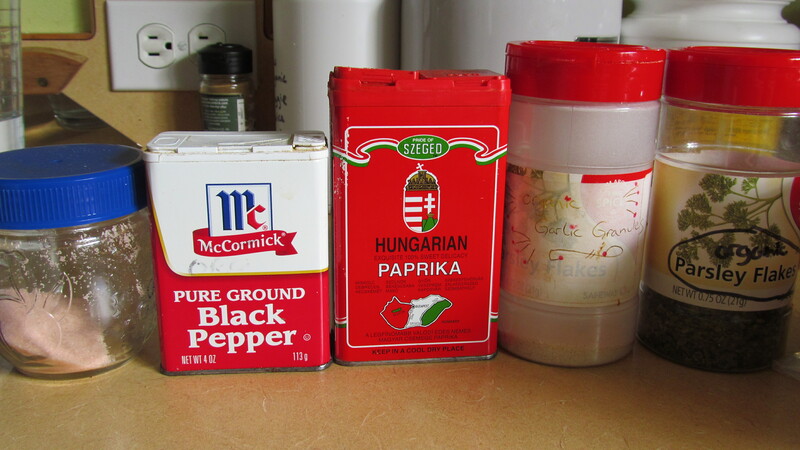 I always use papers in the tins, by the way, and by the time you finish filling them all, the oven should be hot. This makes 12 full-sized muffins. Bake for about 15 or so minutes — check if they need a minute or two longer. Let them cool on a rack. They peel way better if you wait! If you aren’t going to finish them in a day or two, store them in the freezer to keep them from going bad. They last for a long time that way, and are super easy to heat up (or eat cold! ), and they make a very nutritious and easy breakfast-on-the-go. Posted in Food	| Tagged baking, breakfast, coconut flour, Cooking Day, eating well, enjoy your food, food, good food, how to make good food, making healthy choices, muffins, quick and healthy food, recipe, snacks, tasty tasty! 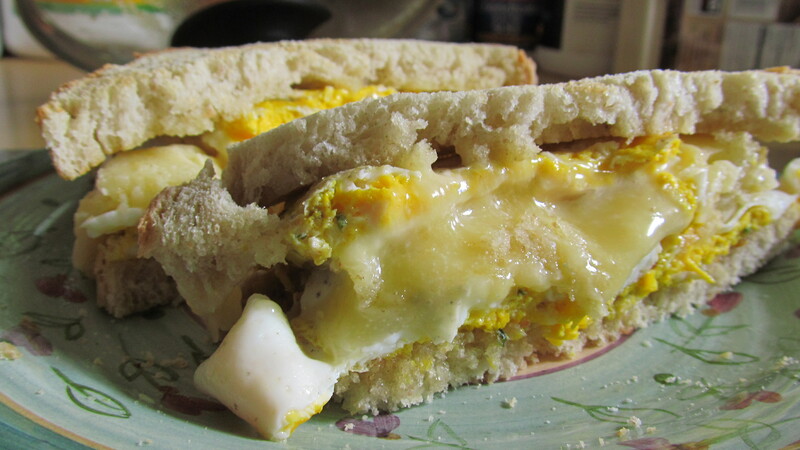 The Perfect Fried Egg Sandwich. The secret to a great fried egg sandwich is… well, actually, to be honest there are many tips to making the perfect fried egg sandwich (excellent for any meal). Pro Tip #1: Use Good Food to Make Good Food. It’s worth a little extra money and/or time because it will taste awesome and be healthy for you. Salt. Always use sea salt — this is Pink Hawaiian — because it has all the trace minerals in the same proportions as your plasma, sweat, and tears. Rock salt does not; that’s why they started adding things like iodine, and it can actually be harmful to your body. Pepper. Fancy peppers are great, but even just a basic black pepper is good. Paprika. For that little something extra. It has different styles, colors, and flavors depending on the country of origin, so experiment and find out what kind you like best. 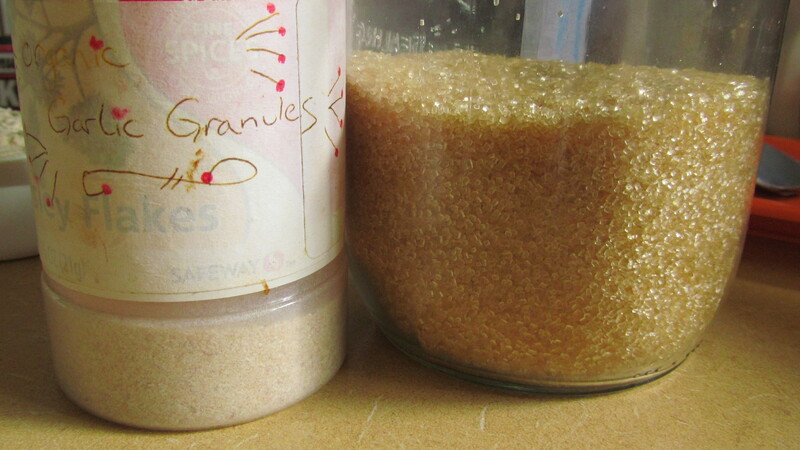 Garlic powder. I add this to basically everything savory ever. Parsley flakes. Like any leafy green, it’s better to get this Organic. 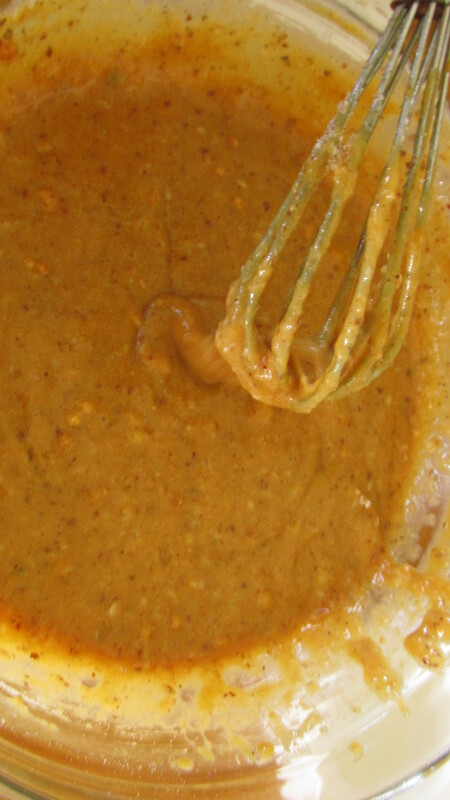 Also consider adding: onion powder, chives (fresh or dried), and whatever else you fancy. My mum taught me that the best way to tell if something will taste good in a dish is to smell it. If it smells like it belongs, add it! 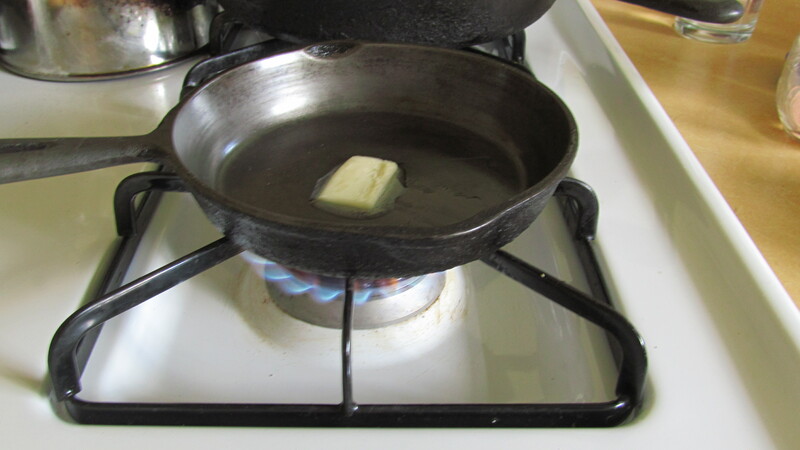 Start by heating up a small pan over medium-high heat. 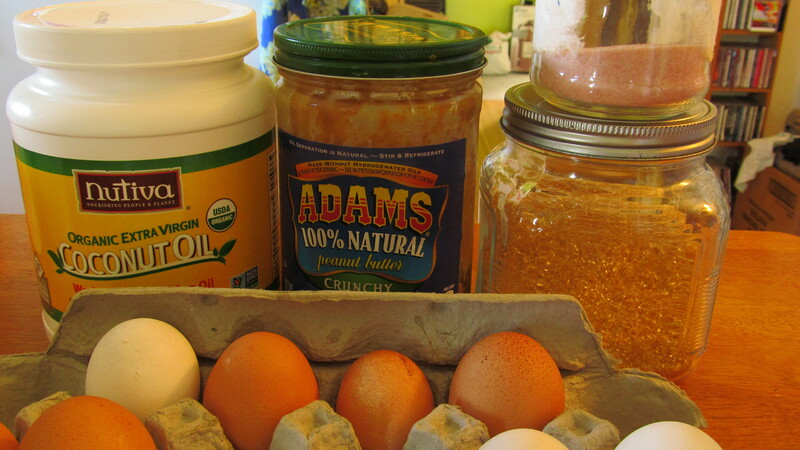 I always cook in cast iron, and for eggs I like to use butter or macadamia nut oil. Don’t use a vegetable oil — they are terribly unhealthy, and break down with heat. 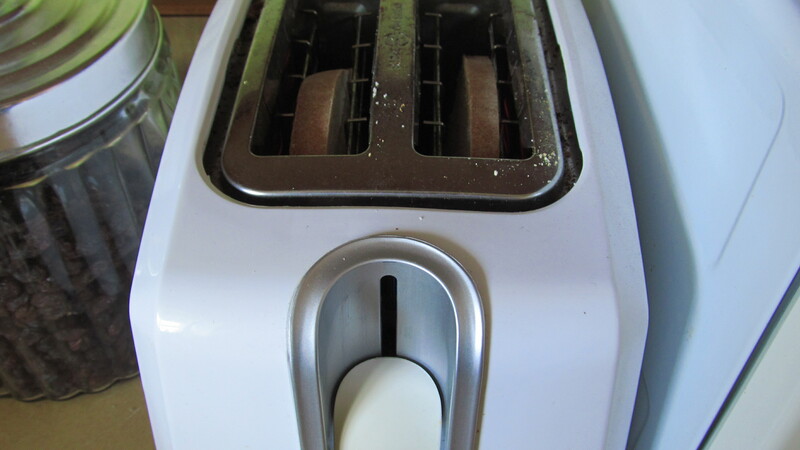 At the same time, start toasting your bread. I use a homemade sourdough. Sourdough is the healthiest bread, because the fermentation process makes nutrients in food easily accessible to our guts. If you don’t have time or inclination to make it yourself, find a local bakery — it’ll be fresher and more delicious than the bread from a supermarket. 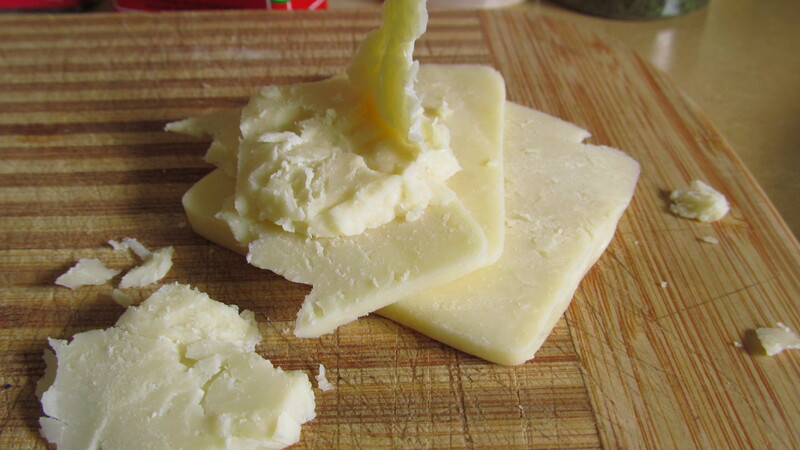 You’ll want to get your cheese ready now, too. Just a slice or two will be enough. I always try to buy Tillamook or similar quality. The type of cheese you use is up to you — personal taste is everything in these matters — but make sure it’s a good quality brand. The taste of a bad cheese will ruin an otherwise perfectly good sandwich. And again, this is a great opportunity to find something that will actually be healthy! Do a little research and make sure that at the very least, the cows producing the milk are grass-fed and pastured. It really does make a difference, and the cheese will taste so much better, and be better for you. I use two eggs for a full sandwich — one, if I only want a half or something lighter, or if I have sausage to add to it. This time I ended up with a double-yolker, so it looks like three! I use the edge of the shell to break the yolks. You can use the edge of the spatula instead, if you prefer. A good test of egg quality and health is the color of the yolk. These farm-fresh eggs have dark orange yolks because the chickens are healthy, given fresh greens to eat, and have room to run around. Make sure to get eggs from free-range chickens, at the very least. Factory chickens are kept in extremely sickening and unethical conditions, and the health of the eggs reflect that. I never eat factory eggs, even when I can’t get them from a farm. As soon as the yolks are broken, sprinkle your seasonings over the top. The amounts are up to personal taste. If you’re not sure how much to add, just remember that it is far easier to add more later or next time than it is to remove them! Use the spatula to get an even spread of seasonings and yolk over all the whites, but not so much that it turns into a pan-scramble. 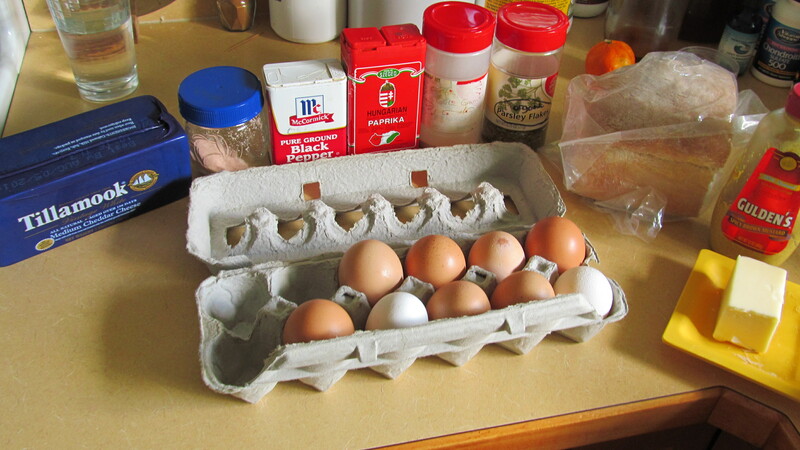 Do this by only disturbing the top layer — leave the bottom of the eggs alone to set and cook. 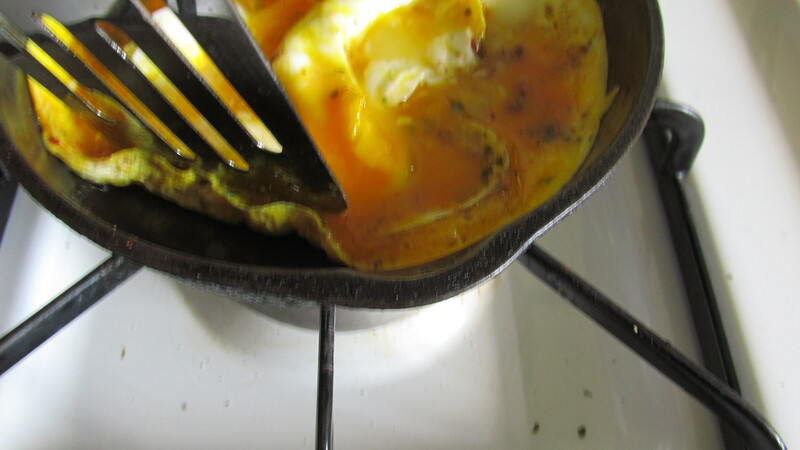 With a hot pan to start with, it won’t take long for the eggs to cook. 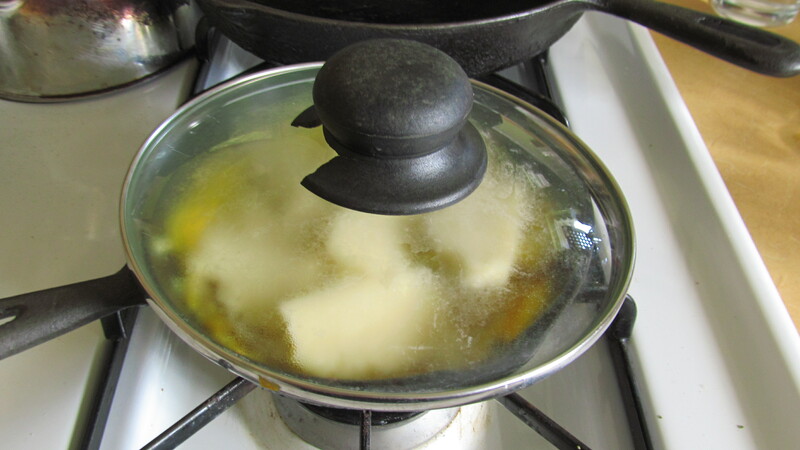 As soon as the bottom gets firm enough, start to gently push it from the sides of the pan. The runny top layer will spill onto the bottom — help this process by gently tipping the pan to each side as you use the spatula. 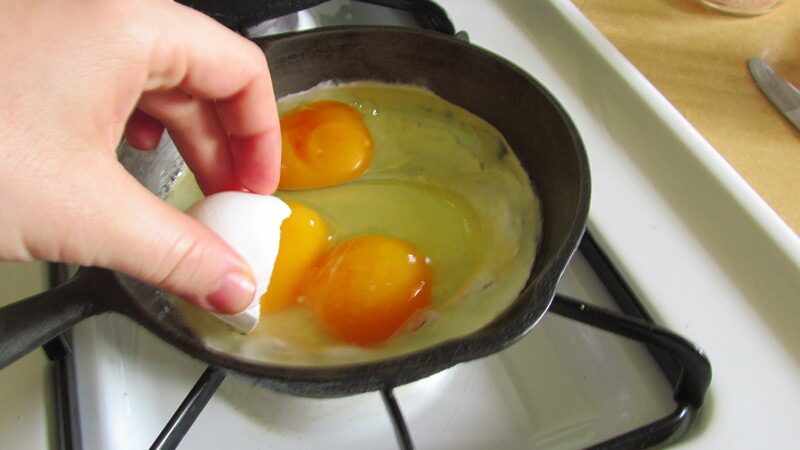 As soon as enough of the eggs are firm — like the above photo — turn down the heat to low and flip the eggs over completely. If you are using an electric burner, turn the heat down sooner, or turn it off now. If the flip was successful, there will be only cooked egg on top. 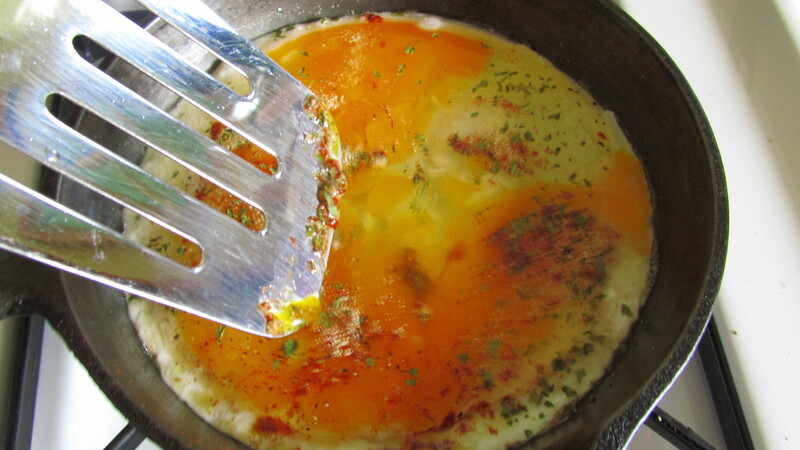 If not, just adjust the eggs in the pan until anything uncooked is touching a hot surface. Immediately add the cheese over the top of the eggs — this is why you want to have it cut up ahead of time. Cover the eggs and cheese with a lid. Turn off the heat, or remove the pan from the heating element on an electric stove. 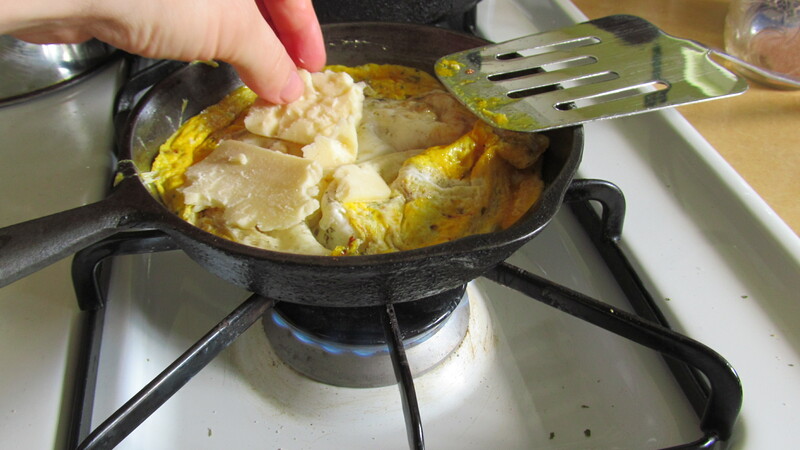 The residual heat in the pan will finish cooking the underside of the eggs without over-cooking or drying them out, and the heat of the eggs trapped by the lid will start to melt the cheese. By now, your bread should be toasted. Get it prepared with your favorite condiments. 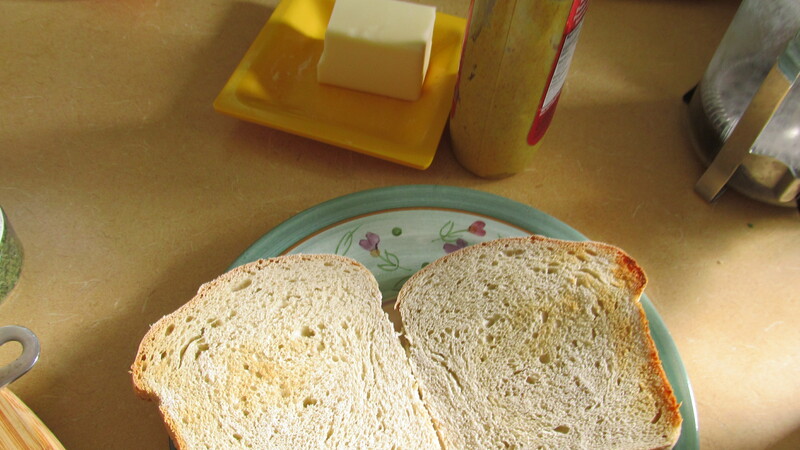 Mustard and mayonnaise are always classic, or you can be adventurous with a sweet/savory combo by using a jelly, jam, or marmalade with butter. Or come up with something totally new, that even I never thought of trying! Dividing up the eggs with the edge of the spatula before transferring it to to your toast helps with getting even distribution. Don’t worry if the cheese hasn’t fully melted yet. 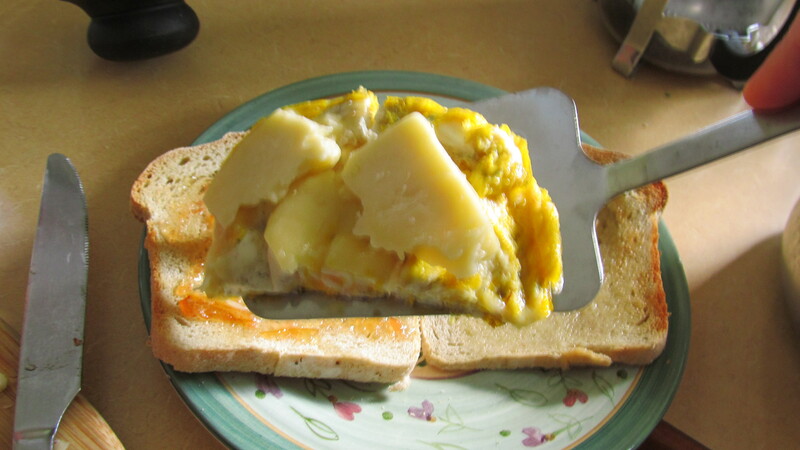 The combination of hot eggs and warm toast should finish the job. I always cut this sandwich in half to eat it. It fits my hands better, for one thing. For another, it can get to be pretty messy…what with the cheese melting out of the edge and the overflowing tasty eggs…especially if you add lettuce or other veggies (which, while totally yummy, have the unfortunate habit of helping things slide off toast), or mushroom and onions, or a patty of sausage dripping with juices… Basically, what I’m saying, eat this with a napkin handy. What I’m also saying is, there are a ton of variations and additions you can experiment with, to create a truly deluxe and unique fried egg sandwich. This is just a starting place. Have fun with it, try new things, and enjoy your food!